Imagination International, Inc. is revolutionizing the art materials industry with new tools, including a new innovative one of a kind easel, a non-toxic, low voc multi-purpose adhesive, and a world renowned DIY paint system. DALLAS - Feb. 28, 2018 - PRLog -- Over the past six years, Imagination International Inc. (iii), the well-known distributor of Copic Markers for the North American region, has been expanding its reputation as a manufacturer and importer of other quality art supplies. This year the company is announcing several new ground-breaking products at NAMTA, the big trade show for the creative materials industry, hosted by The International Art Materials Association - NAMTA® in Dallas, TX starting this weekend, March 4 - 6. "Copic Markers grow every year, year after year," John Darland (President of iii) explains. "Since then, we used what we built and the trust people have in us to bring in other high-end, quality products that are really unique, and offer them to the same channels in the art supply and hobby world." Last month the revolutionary new "Everyday Easel" was revealed at CreativeWorld in Germany, where it made a lasting impression on art supply distributors, retailers and artists alike. 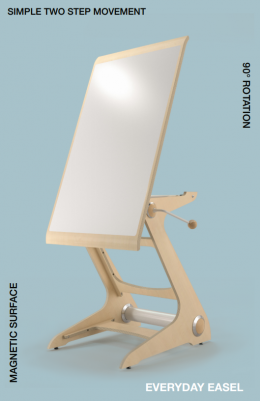 The firm is taking orders for the easel and expects shipping in early June to outlets worldwide. "Someone brought an idea to my team and we created this thing from scratch," Darland said. "The easel has been the same for hundreds of years, and our approach is completely different." In addition to the Everyday Easel, Imagination International continues to do what it does best as a wholesaler of other art-related products. For the growing audience of creative 'do-it-yourselfers', the company is now distributing two new products, both with a strong demand in the North American market. The DIY Paint System by Tommy Art is the only mineral based system produced pigment to finished product in Italy. It includes over 80+ products, broken down into five user friendly categories including: Texture, Shine, Special, Color, and Finish. A stronger, low voc, non-toxic non-solvent based glue called BETTER, is unlike any other adhesive you'll see on store shelves. Made in Japan by the leading adhesive supplier, this glue is truly versatile with its super strong yet flexible bond. It adheres to almost any surface type: wood, metal, glass, plastic, styrofoam, fabric, paper and more. NAMTA members attending Art Materials World also have the opportunity to explore the creative possibilities of a moldable thermoplastic by Thibra. Developed and manufactured in the Netherlands, this 100% biodegradable thermoplastic product is already in high demand within the cosplay, art, and product design industries. If you're coming to NAMTA's Art Materials World, come have a closer look at everything we're showcasing (Copic Markers, too) at the Imagination International Inc. booth #845! Right next to the NAMTA demonstration room.